Nigel Eccles from Fanduel tells us about the company and how they came to have an office in TechCube. 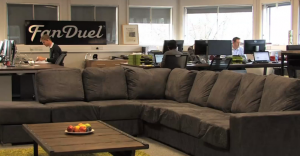 Fanduel is a daily fantasy sports game marketed to the US market. The game allows players to draft real world athletes from either NFL, ice hockey, baseball or basketball to a team and play against others in competitions with an opportunity to win real cash prizes.